How does Samsung’s latest Galaxy S10+ flagship compare versus Apple’s iPhone XS Max from 2018? YouTube channel PhoneBuff has released its unscientific speed test featuring these two top-tier smartphones, which traditionally has seen Apple’s iPhones dominate. But this latest test finally sees the iPhone XS Max falter, letting the Galaxy S10+ take the contest. This win by the Galaxy S10+ marks the first time a Samsung device has beaten the latest iPhone, since the Galaxy Note 5. Prior to this defeat, the iPhone XS Max was the reigning speed test champ during PhoneBuff’s tests, with an undefeated streak. PhoneBuff’s speed tests rate the speed at which a smartphone can open a set of apps once, then again a second time, testing multitasking capabilities. 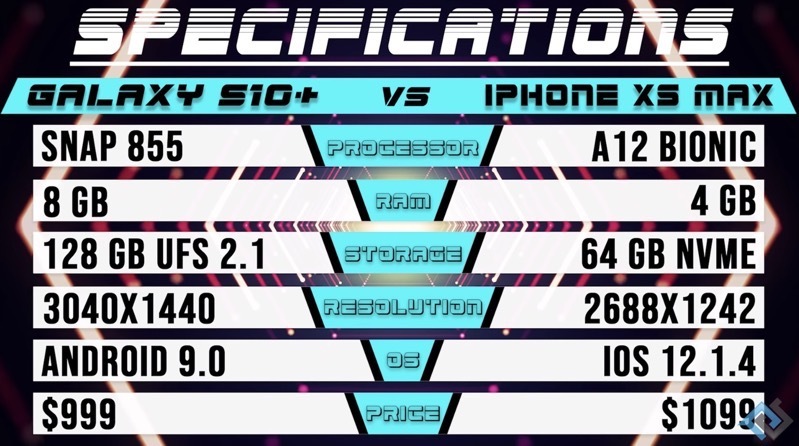 The video below shows the iPhone XS Max ready to take the win after the second round, but it faltered at the end as a few apps did not remain open and were forced to reload, allowing the 8GB of RAM in the Galaxy S10+ to do its job, versus the 4GB on the XS Max.